We’d love your help. Let us know what’s wrong with this preview of Siren by Soren Summers. Gabriel Anderson came to Pleasance to help his father. Instead he finds a strange new career, an obsession from the past, and a shadowy corporation teeming with danger. Yet he isn't afraid, not as long as he keeps his father in his heart and the man he loves at his side. But sometimes the most dangerous enemies don’t dwell in shadows. Sometimes, monsters ​"You're the worst." Yet he isn't afraid, not as long as he keeps his father in his heart and the man he loves at his side. But sometimes the most dangerous enemies don’t dwell in shadows. Sometimes, monsters live in plain sight – or in mirrors. 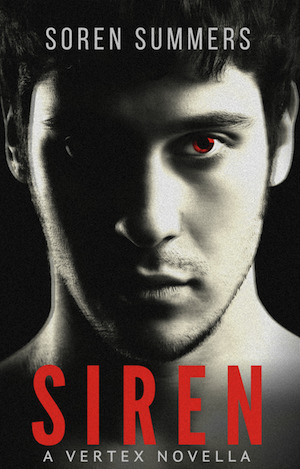 To ask other readers questions about Siren, please sign up. This book is meant to be read between Monster and Parasite, and is only available on my website. Spoilers abound, so if you haven't read the first book, please don't peek and ruin it for yourself! It's nice to get Gabriel's thoughts on the events of the first book. Total companion book to the first one, really helps to understand Gabriel's POV, as he comes accross as somewhat manipulative in the first one. Still bloody and tropey though. This was a good novella from Gabriel’s POV from book 1... I clearly got a better understanding of Gabriel with this book.. so for that alone it was worth reading.. off to Smolder! I love video games, staying home on the weekends, and geeky guys. Hi, Soren here. After 15 years spent working in lifestyle journalism and public relations I decided it was time to stop selling other people’s stories and start telling my own. I’m obsessed with writing about ordinary people struggling against overwhelming supernatural odds. I’ve also been told that I’m kind of charming. No, really.